The ever popular Spinosaurus. Originally found in the desert near Egypt (mid Cretaceous rocks) at the beginning of the 20th century, all the original material was lost during the bombing of Germany during WWII. We are lucky to have drawing of the material so all was not lost! The original material which consisted of the front part of the lower jaw, a few neck vertebrae, a few tail vertebrae, and most of the back vertebrae with the elongated neural spines. The original restoration was of a giant allosaur with a sail, like this drawing. The exact size of is hard to pinpoint. The original material appears to not have been fully grown. Sizes from 50 to 65 feet have been offered, but we'll have little to no idea until a new skeleton is found. For a long time that was the restoration, until the 80's, when Baryonyx was found. It was quickly discovered that the 2 species were very similar, that gave us our first decent peek at what a spinosaur looked like. In this restoration I bulked up the skull a bit, the lower ends shortly after the tip, but the back of the jaw bone looks very robust. 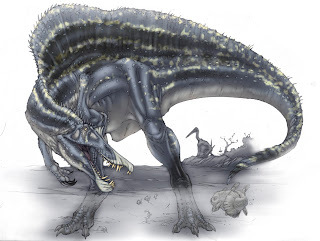 So I toyed with the idea that Spinosaurus was sort of returning to a more predatory dinosaur, Baryonyx was considered a fish eater (even though iguanadon bones were found in it's stomach contents, along with fish scales) so the skull was more delicate. It was reported that a new skull was found earlier this decade, something that would have been around 8 feet long. Now there was/is a possible relative of Spinosaurus, or in this case a subspecies, also found in Africa, this was dubbed Spinosaurus marocannus. Only the front part of the upper jaw was found, it was very delicate. But this new skull, seemed to link the 2 species/subspecies together, the new skulls teeth matched the original lower jaws teeth so it appears that the more robust skull I drew was wrong, so this drawing was done. This is the most recent drawing, based on all the info I could find online. 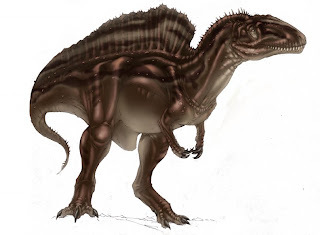 It looks like Spinosaurus is actually closely related to the South American spinosaur Irritator. At first Irritator was thought to be a pterosaur (it's skull is really strange even for a spinosaur,) but the new skull material for Spinosaurs matches it rather closely, even similar in tooth count. But what of the sail? It's been theorized that it was for fat storage, but the spines are very thin, I doubt they could have supported much weight. Possibly for cooling? Other theropods with similar size didn't have one, but maybe it helped when fishing in the afternoon, it does get hot inthe sun. I've also heard it was used as an actual sail for swimming... We know theropods could swim, we have 'foot' prints, really just nail prints;) But none of the other spinosaurs with associated skeletons show aquatic adaptions.. So I had an idea. It might be wrong, but what about a shade for hunting in the sun? Something to keep the glare of the sun off the water so it can see the fish below? Or maybe a combination of these? That's the most plausible scenario seeing as most parts of the body preform several functions. That's a great idea actually; there are birds that have adapted "shading" teqnicues while fishing in order to see teh fish that the yare hunting. 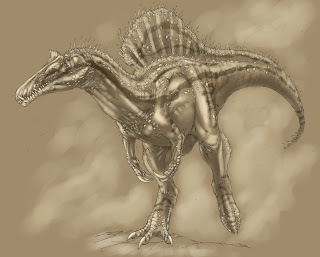 acctually spino's size would easily scare off and protect it from agressors, and u r forgetting the fact that its size means it has to be strong, e.g a powerful side ram? what about it posibly being used to cool down on hot days. i have also heard that they ate many land dino's. 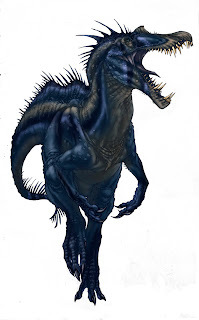 i am also writing a report about spino's i need some more facts about hem could you help me? I think the cool down idea has the least merit, especially since new isotope studies show they were semi aquatic like turtles. I can't really say more as I have inside information on some new material, but I think the land predator idea is now pretty much dead. The 4th spinosaurus is the best spino!!!!! In Planet Dinosaur on bbc, the spinosaurus is not good. Its movement is ridiculous. The legs are too short, and tail is too short. This spino(the 4th) is the BEST spino ever!! It's legs are long like a wader, tail is long, which is cool. I think the spinosaurus is a fish- and a flesheater. It's eat the giant fish, and ouranosaurus. Its a 21 meters long monster!!!! On the first picture the spino is looks like an acrocanthosaurus! Actually the 4th one is incorrect. New finds have shown that spino's had really short legs... I'm of the opinion that they were more like hadrosaurs and walked on 4 legs for part of the time. And the 21 meter size estimate is most likely about 6 meters off. I believe 15 meters is a bit more realistic. There is another more recent spino that I did that shows the shorter legs.